More and more people are seeking orthodontic treatment and at 128 Harley Street Dental Suite, this is no different. Most adults would prefer to be able to have orthodontic treatment without any aesthetic impairment and hence want to fulfil there treatment goals with an appliance that is invisible. The increase in awareness of Invisalign™, which is a series of clear aligners to straighten the teeth with a removable appliance, has caused a growing demand in this area of orthodontics. Invisalign™ is more limited in the types of cases that it can treat successfully where as a lingual appliance can treat all cases. A lingual appliance is placed on the inside of the teeth, it works like a conventional brace, so that you can get full control and movement of the teeth, but it cannot be seen. There are many lingual appliances on the market, but here at 128 Harley Street Dental Suite a variety of lingual braces are available including: WIN GmbH, Incognito™, Harmony™, Forestadent 2D Lingual™. 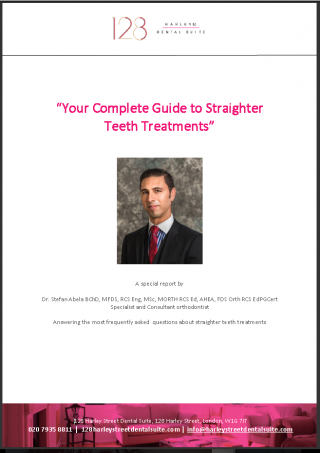 There is also a demand for invisible orthodontic treatment amongst younger patients. Many teenagers now realise that braces which do not show are a treatment option for them as well, and they much prefer them. With both adults and adolescents asking for this type of brace, it is important to use a fixed appliance system that delivers both high patient satisfaction and clinically excellent results. Lingual braces are completely invisible form the outside. There is no aesthetic impairment. Braces on the outside even if they are tooth coloured still show and this is why many patients avoid fixed appliance therapy. The appliance is custom made for you, so that each bracket and wire is made only to fit your teeth. Achieving an ideal occlusion for an adult patient is extremely difficult as often the natural teeth do not meet ideally, possibly due to damaged, extracted, missing or heavily restored teeth. High quality professional laboratory processes take this fact into account by the creation of an individual target set up. This is used as a basis for designing and optimising the appliance. How does Invisalign compare to the other brace systems?